4325 ✉ 4II 6 Kr. Brown, type II. 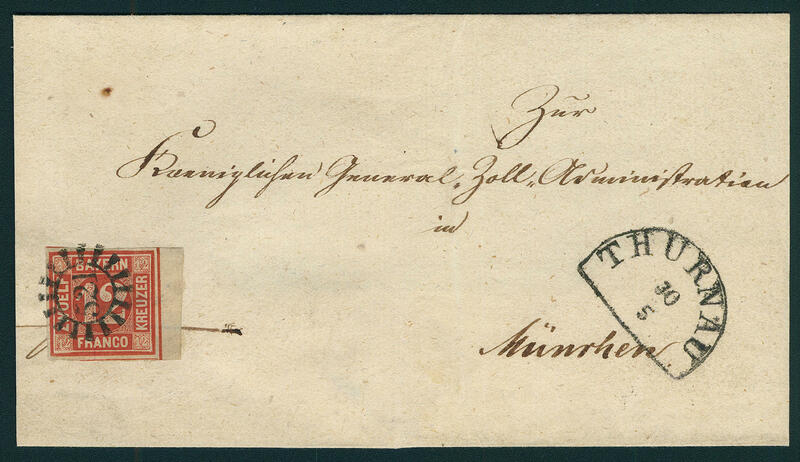 Plate 1, fresh colors, left close margins, otherwise good margins, Vortrenn cut in of the right lower corner, on attractive cover with closed millwheel postmark \"92\" and very scarce additional single line cancel from the pre-philatelic time \"FREISTADT\" to Eichstaett. There are only a few letters from the stamp using time with this stamp have become known! Photo expertize Brettl BPP. 4326 ✉ 5aaIII 9 Kr. 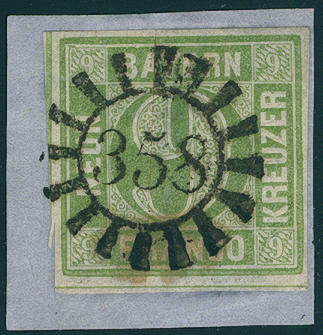 Dull blue green, type III, first issue, on all sides full- to having huge margins with a part of the lower neighbour stamp, typical, storage-caused age patina on correctly franked registered cover the 3. 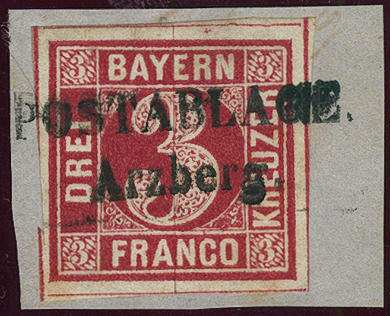 Distance zone with closed millwheel postmark \"243\" and additional ornamented cancel \"Nuremberg 25. 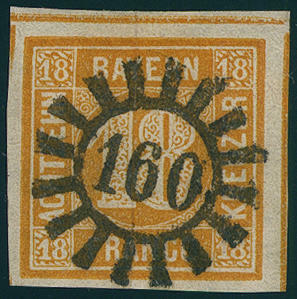 November 1850\", where the 6 Kr. Registration fee has been paid in cash by the sender. Photo expertize Stegmüller BPP. 4327 ✉ 5c 9 Kr. Yellowish green, wonderful fresh colors and good margins with clear closed millwheel postmark \"171\" from Lambrecht / Palatinate with additional scarce semicircle cancel \"LBR. GREVENHAUSEN 29.1. 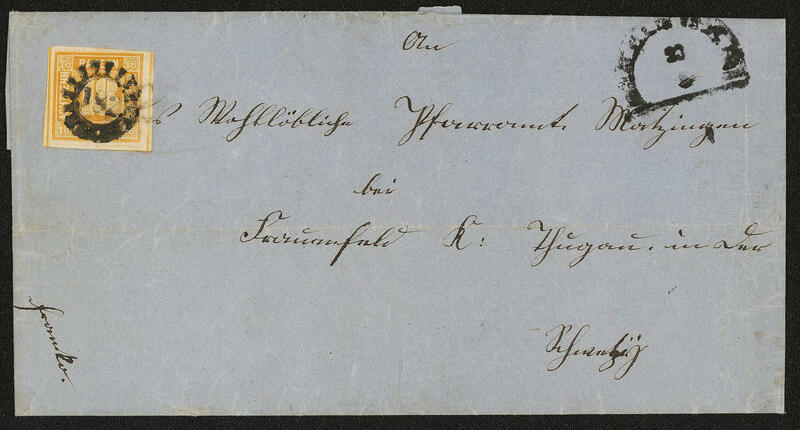 (1853) \" and handwritten notation \"sample without value\", as well manuscript line cancel \"RH. 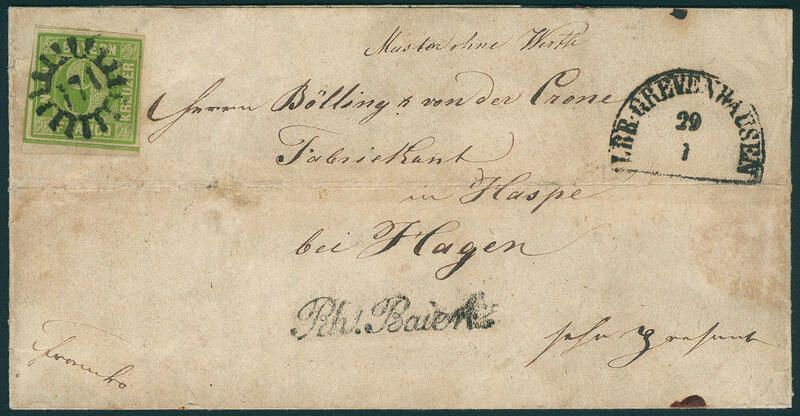 BAIERN\" to hasp by Hagen with full content. An extraordinary Palatinate cover! 4328 ∆ 5dIII 9 Kr. Yellow green, type III, having bright colors and piece in outstanding quality with enormous margins on magnificent letter piece with perfect, pricked clear closed millwheel cancel \"358\", photo expertize Sem BPP. 4329 ⊙ 5dPapier 9 Kr. 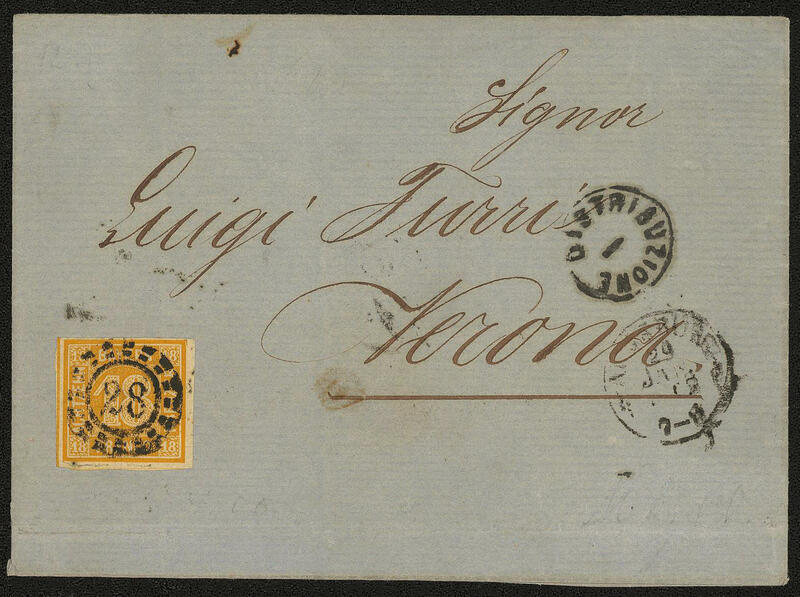 Bright yellow green, type III, having bright colors and on all sides piece in outstanding quality with enormous margins on scarce thinly paper (silk paper) with centered clear open millwheel postmark \"19\". A connoisseurs piece! 4330 6 12 Kr. Red, wonderful having bright colors, on all sides piece in outstanding quality with enormous margins with large parts the intermediate lines, in perfect condition unused with original gumming, expertized Brettl BPP. 4331 ⊙ 6 12 Kr. Red, wonderful having bright colors, on all sides piece in outstanding quality with enormous margins with cut lines on all four sides and clear closed millwheel postmark \"267\", expertized Pfenniger, Brettl BPP. 4332 ✉ 6 12 Kr. 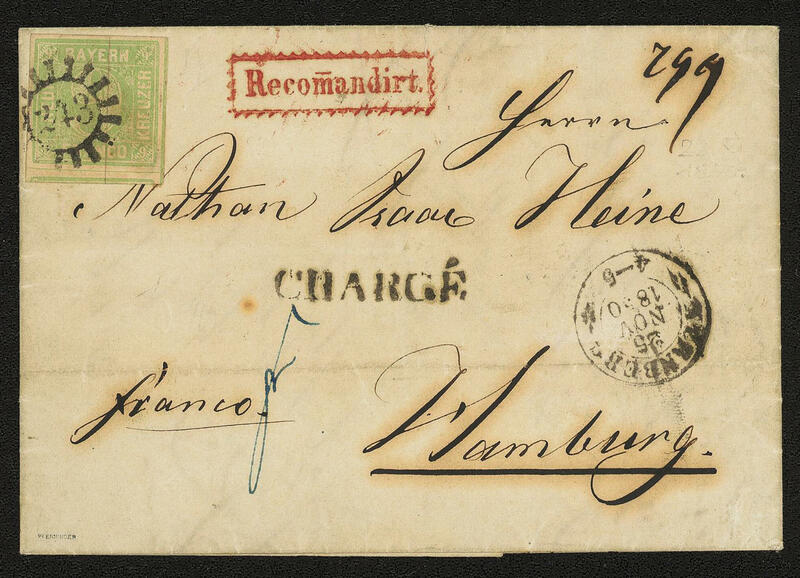 Red, fresh colors, large margins all around from right margin of sheet with clear closed millwheel postmark \"521\" and additional likewise clear semicircle cancel \"THURNAU 30 / 5 (1860) \" on cover, without side flaps, to Munich, slightly higher signed Brettl BPP. 4333 ⊙ 7 18 Kr. 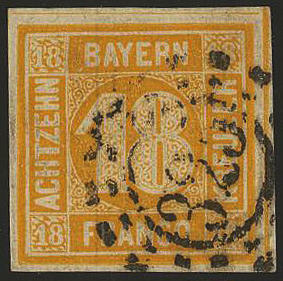 Orange yellow, horizontal pair, wonderful fresh colors and good margins, with two especially beautiful centric mounted open millwheel postmarks \"226 (INGENHEIM) \". An especially nice pair in outstanding quality this highest denomination value within a small city in the Palatinate used! Photo expertize \"faultless condition\" Schmitt BPP. 4334 ⊙ 7 18 Kr. 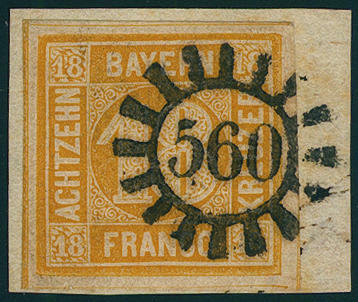 Yellow orange, illuminating fresh, on all sides piece in outstanding quality with enormous margins with especially nice and centric, razor-sharp mounted closed millwheel cancel \"160 (KITZINGEN) \". An exception copy for your highest requirements! Expertized Brettl BPP. 4335 ⊙ 7 18 Kr. 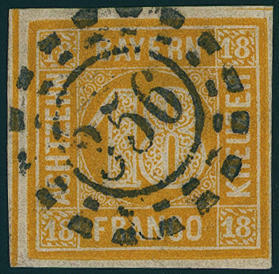 Orange yellow, fresh colors and enormous margins on all sides with four cut lines and closed millwheel postmark \"396 (WÜRZBURG) \". An exception copy! Photo expertize \"faultless condition\" Schmitt BPP. 4336 ⊙ 7 18 Kr. Yellowish orange, having bright colors and on all sides with enormous margins extremely fine copy with open millwheel postmark \"325\", expertized Brettl BPP. Michel 240,- €. 4337 ∆ 7 18 Kr. Orange yellow, wonderful fresh colors, on all sides enormously with wide margins with three complete intermediate lines on very nice letter piece with clear and straight mounted closed millwheel postmark \"560\". An outstanding quality for the highest standards! Expertized Pfenniger. 4338 ✉ 7 18 Kr. Yellow orange, wonderful having bright colors and on four sides with full margins outstanding quality, three sided enormously with wide margins, above and right with intermediate lines, on very nice domestic letter the 3. Weight step with clear open millwheel postmark \"356\" and additional adornment two ring cancel \"Nuremberg 4. 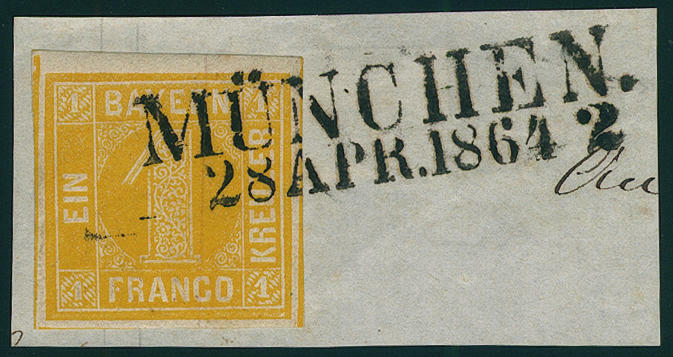 December 1860\" to Munich. Outstanding quality! Photo expertize \"faultless condition\" Brettl BPP. 4339 ✉ 7 18 Kr. 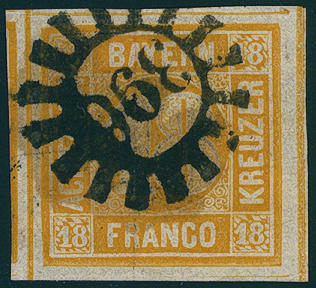 Yellow orange, wonderful having bright colors on four sides with full margins outstanding quality, left and at the bottom with intermediate lines, as correctly franked single franking on very nice cover with centric mounted clear open millwheel postmark \"28\" and additional single circle postmark \"AUGSBURG 29. January 1862\" to Verona / Italy with single circle postmark \"DISTRIBUZIONE\" and on the back transit cancellation from \"INNSBRUCK 30.1. (1862) \". A very nice and rare cover the double weight step! Photo expertize \"faultless condition\" Brettl BPP. 4340 ✉ 7 18 Kr. 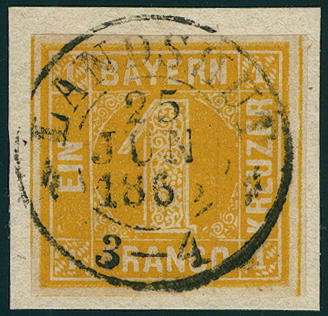 Yellow orange, fresh colors with closed millwheel postmark \"182\" and additional semicircle additional cancellation \"LAUINGEN 23.5. 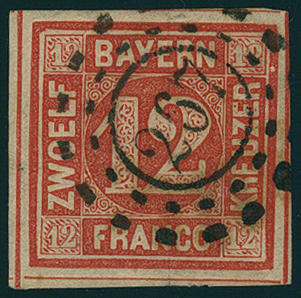 (1856) \" on cover to Frauenfeld / Switzerland. 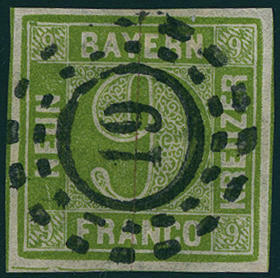 The stamp is on all sides wide to enormous margins cut, three sided with intermediate lines, in the right margin sweeping parts the address are user-related and places no lack dar. Photo expertize Stegmüller BPP. 4341 ⊙ 7Abart 18 Kr. Yellow orange with very rare variety \"double silk thread\", wonderful fresh colors and good margins, mostly with wide margins cut with clear centered open millwheel postmark \"356 (Nuremberg) \". 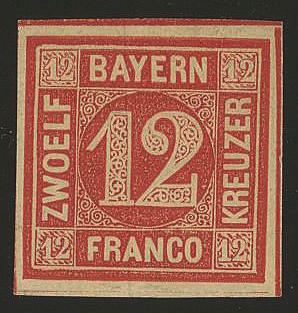 An outstanding quality of this scarce variety, the especially on the high denomination value only in few copies known is. Photo expertize \"faultless condition\" Stegmüller BPP. 4342 ∆ 8I 1 Kr. 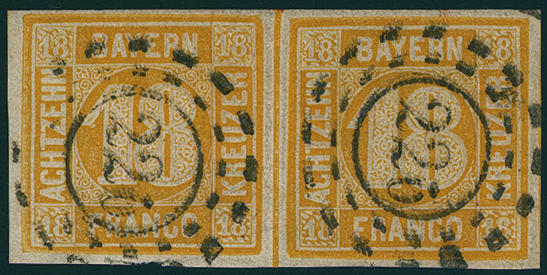 Yellow, fresh colors and good margins on magnificent letter piece with pricked clear two line cancel \"Munich 28. April 1864\". Outstanding quality! 4343 ∆ 8I 1 Kr. Yellow, wonderful fresh colors and with wide margins on magnificent white letter piece with centered, turning into and straight mounted two ring cancel \"LANDSHUT 25. June\", outstanding quality! 4344 ∆ 9a 3 Kr. Red, fresh colors and large margins all around with almost all intermediate lines on beautiful letter piece with clear two line cancel \"small postal agency ARZBERG\", superb in every respect (choice copy).